All of our three video clips made in the International Summer University and the project cool, took all three prizes, as follows, (1) “Der Tisch” (The Table); (2) “Die Erde hat Fieber (The Earth has a fever); (3) “Spiegelsoldaten” (Mirror soldiers). This institutional award was presented to the Collegium on the 19th of September 2011. The KMGNE, it was stated, showed impressively how future-appropriate education can look like. “The jury, with its vote, recognized the Collegium’s ability to convey in an understandable manner how people can act sustainably,” said Prof. Gerhard de Haan, Chair of the National Committee and of the jury for the UN Decade in Germany. In Schwerin on November 25th, the project COOL – Change of our Life was awarded a prize at the 4th Talents and Ideas Day, 2010, by Henry Tesch, State Minister of Education, Science and Culture of the State of Mecklenburg- Vorpommern. On the 26th of June 2010 the ‘Cool – Change of our life’ project received an award in Güstrow for its successful participation in the statewide environmental contest “Setting the course: A Good Climate for a Future in Mecklenburg-Vorpommern. On the 29th of April 2010, the Munich publishing house Oekom awarded two of the three prizes in the competition to the video “Technologien” and the essay “Eine Geschichte zur Ökosteuerung” (A history of eco-management). 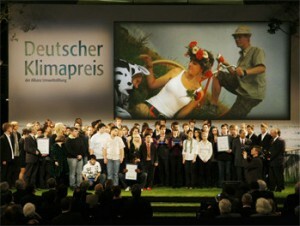 On March the 2nd, 2010, the climate prize was awarded for the music video Klimashow with the sponsorship of Minister of the Environment Röttgen. ’COOL – Change of our Life’ is an official project of the ‘World Decade of Education for Sustainable Development’. On July the 10th, 2009, the Day of Open Studios, the “Selected Locations in the Land of Ideas” award was presented. As a “Selected Location,” the Collegium represented the innovation potential and future capability of our country with the International Summer University “Audiovisual Communications: Renewable Energies, Energy Efficiency and Climate Change”. ’Cool – Change of our life’ is to be given an award at the sustainability project 100×100 at the Mecklenburg-Vorpommern Solar centre, an external location of the Federal Horticultural Exhibition (BUGA). The music video „Heißbär“ was given an award at the 14th Neubrandenburg Youth Media Festival. On May the 19th, 2006, the video clip “Gehen wir oder bleiben wir“ (To go or to stay?) was presented and given an award at the Short Film Competition OFFENBARUNGEN (Revelations) at the Berlin Ullstein Hall. Of more than 100 submissions, fourteen were nominated for the contest. The Jury, consisting of Trevor Peters, Wolfgang Pfeifer and Filipa Cesar, stressed the special coherence of content and aesthetic form.